The landing of NASA's Curiosity rover on Mars this month got me hankering to build a Mars papercraft. Here's my favorite model: a papercraft Mars topographic globe by Eotvos Lorand University Cosmic Materials Space Research Group in Budapest. There's lots to like about this model. 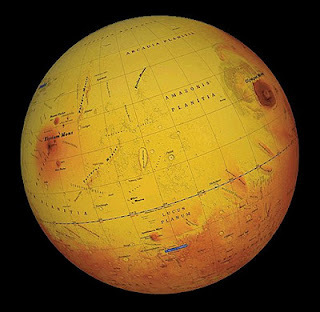 First, it is available in a high resolution template that clearly shows the surface features of Mars. Second, there is extensive labeling of the surface features. Finally, the resting places of the first ten landers to make it to the surface of Mars are pinpointed, from the Soviet Mars 2 lander (1971) to NASA's Phoenix lander (2008). The blue tag in the image above is the location of the Spirit rover (2004) (Though not labeled, Curiosity's location is at the far left of the globe just below the equator). The template for the Mars globe was intended to be printed and wrapped around a sphere, but if you have decent papercrafting skills the creation of a hollow papercraft globe should be an easy task. The JPG globe gore template may be downloaded here. Cartoon Network, home of the ever popular Adventure Time animated series, offers twenty different Adventure Time paper toys on their website. 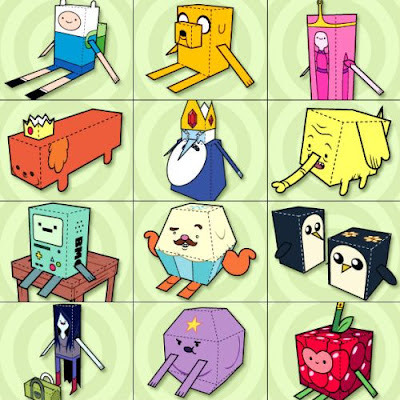 Among the characters available are Finn, Jake, Princess Bubblegum and Ice King. There are also three different stage sets on which to display your paper creations. The download page is located here. In the Kingdom Hearts series of video games, the character Axel uses two large chakrams as weapons. Pictured is a life size paper model of one of Axel's chakrams. 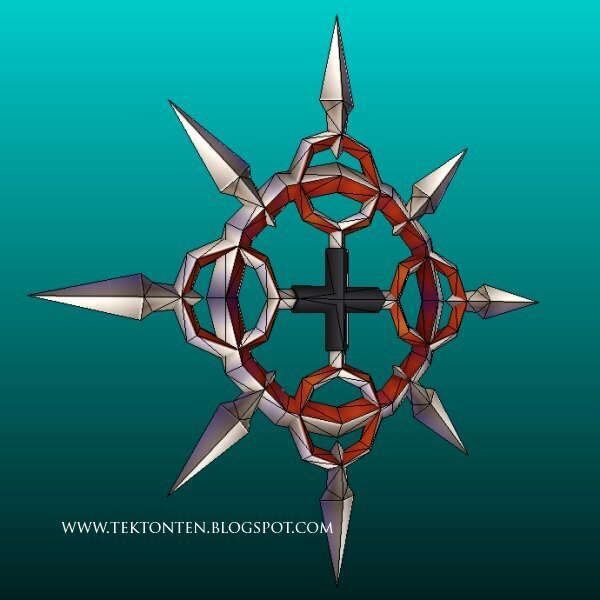 Based on a 3D model from Kingdom Hearts: Final Mix, the chakram was created by EuTytoAlba for use in cosplay. The template may be downloaded here. Both Pepakura PDO and PDF templates are included in the download. NASA's Project Gemini involved 10 missions that took place from 1962 through 1966. Gemini's purpose was to test techniques that afterwards would be used in the Apollo Program. 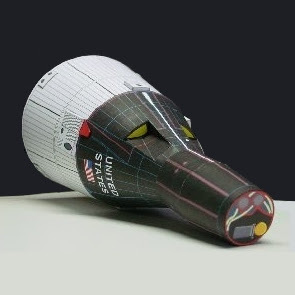 This paper model of a Gemini space capsule was designed by Ton Noteboom. Ton specializes in paper models related to US and Soviet space exploration. The free PDF template for the Gemini capsule may be downloaded here. This Wargreymon paper model is the work of Marcos Papercraft. 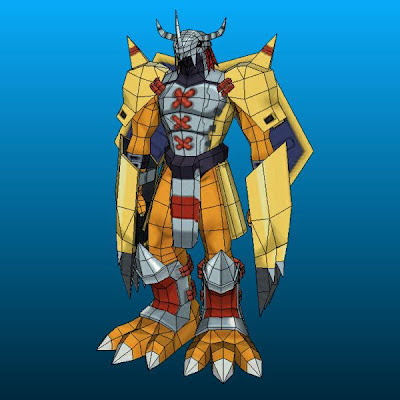 Wargreymon is a reoccurring character in the Digimon anime/video game franchise. He is a humanoid beast Digimon of the vaccine type. His armor is made entirely of Chrome Digizoid, which absorbs incoming attacks without sacrificing mobility. Wargreymon carries on its back the Brave Shield, which are two halves of a shield engraved with the Crest of Courage. The template for this papercraft may be downloaded here. Also available on the same page are two models of Digimon related to Wargreymon: Koromon and Black Wargreymon. The Twitter mascot gets crossed with Jason Vorhees in this paper toy by Rosaura Ochoa. Can Halloween be far away? 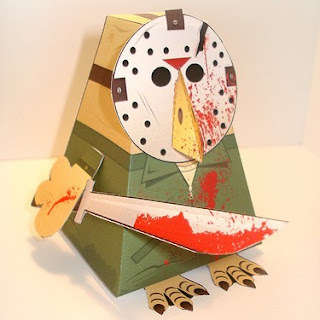 ;) Jason as you probably know is the main antagonist in the Friday the 13th series of movies. The template for this bloody birdy is available here. 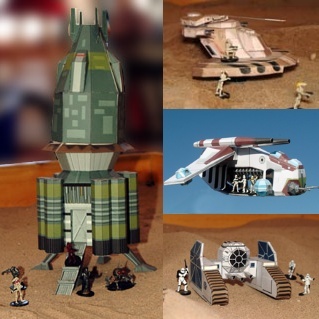 Ghostofman.com has quite the collection of paper models for Star Wars miniature gaming. Many of the models are familiar vehicles from the Star Wars movies. Some of the less familiar models in the collection are vehicles unique to the Star Wars: Empire at War video game. Above is a sampling of the 24+ models available. From left, going clockwise, is a Techno Union Shuttle, a Trade Federation Armored Assault Tank, a Galactic Republic Low Altitude Assault Transport (LAAT), and an Imperial TIE Mauler Tank. 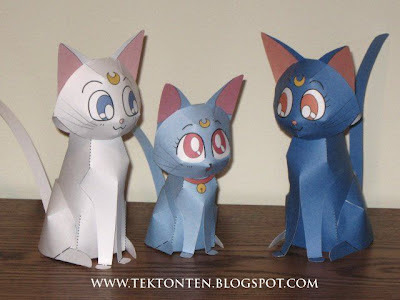 I built these papercraft Sailor Moon cats from templates available at Kinmoku.net, a Sailor Moon fan site. In the Sailor Moon anime, these felines are guardians of the Sailor Senshi (soldiers). From left to right, the cat's names are Artemis, Diana, and Luna. Kinmoku.net offers the templates in .PCT format only, but I obtained permission to convert the templates to PDF files which may be downloaded here. For a sense of the size of the finished cats, the white cat is about 6" (15.2 cm) tall. Enjoy! 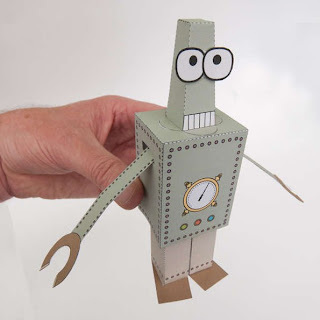 Rob Ives of the Flying Pig website is a master at creating paper automata. Automata are models that use specially designed paper mechanisms to cause movement. Most of Rob's automata are for sale, but this robot is one of his creations that is available for free! Pull the robot's head and his arms move up and down. The PDF template and instructions for the robot are available at Instructables. The Elder Scrolls III: Morrowind video game was released in 2002. Being a predecessor to The Elder Scrolls V: Skyrim, the two games contain similar weapons and items. 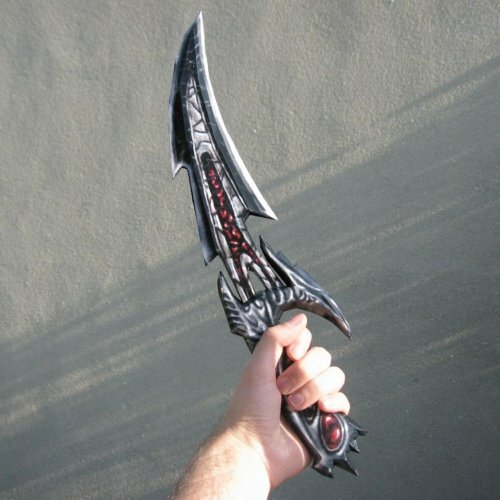 Both games have a Daedric dagger, however the Morrowind version of the dagger is the more ornate of the two. Pepakura PDO and PDF templates for the full scale Morrowind dagger papercraft above may be downloaded at Broken Papercrafts. 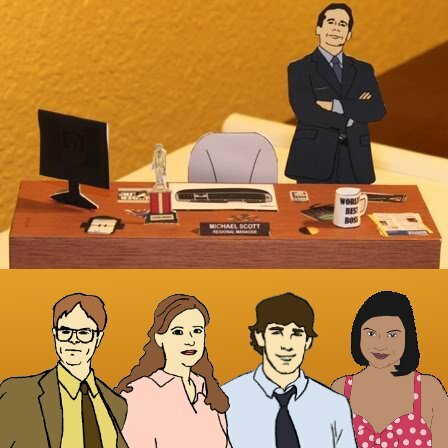 As a piece of fan art, Cat Carlisle created paper dolls of characters from the hit television series The Office. The dolls have changeable accessories and outfits from memorable episodes of the show. The most elaborate of the accessories that come with the dolls is a 3D model of Michael Scott's desk. The dolls are available in two sizes and may be downloaded here. 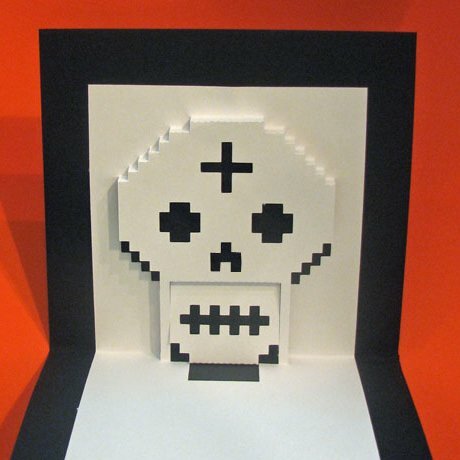 One of the many items offered by Carol at the Extreme Cards and Papercrafting blog is this pop-up paper skull. 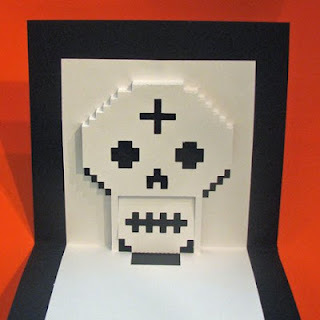 The pop-up may be used as a greeting card, but it would also make a nice decoration for the Mexican Day of the Dead (Dia de los Muertos) coming up in October. The template for the skull, along with instructions, is available here. 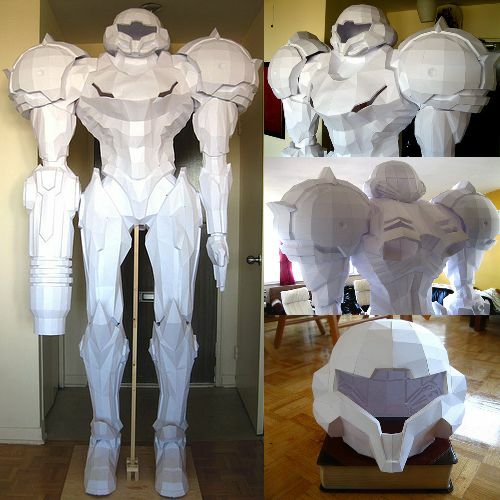 I was impressed by this effort: a life-size paper model of Samus Aran's armor! Using a 3D model from Metroid Prime 2 video game, Flickr member IAmThatOneGuy built the 6'-10" (2.1 meters) tall model over the course of several months. Unfortunately, there is no download for this one, but I had to share because of the "coolness" factor. ^^ More photos of the build may be seen here. The Renault FT tank was developed by France during World War I. The FT continued to be used by the French military up through the mid-1940's, although by that time it was vastly inferior to the World War II era tanks it was up against. The FT is notable for being the first tank to have a rotating turret. 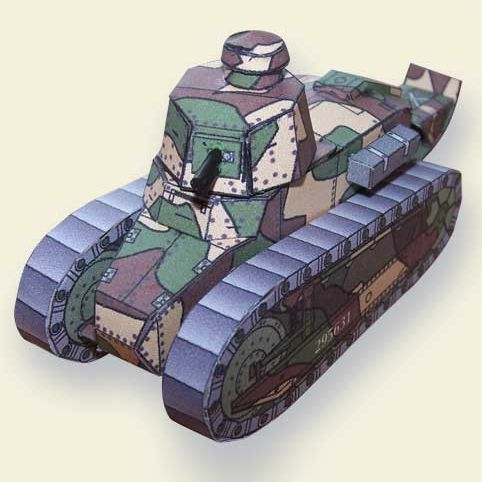 This paper model FZ-17 was created by French model builder Buzuc using Adobe Illustrator. The JPG template is available here. The OZ-13MS Gundam Epyon was featured in the Mobile Suit Gundam Wing anime. At the Gundam Wiki the Epyon's weapons are described as "a segmented, whip-like heat rod, and a powerful beam sword whose energy is supplied by a direct connection to the Epyon's generator". 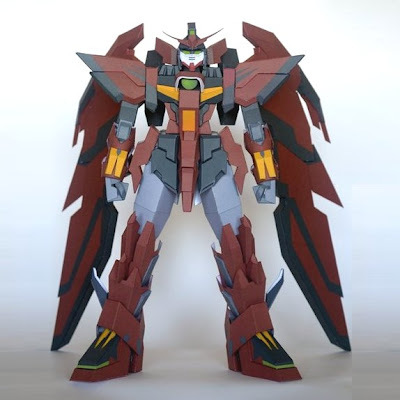 The template for this Gundam model may be downloaded here. This papercraft was designed by StormL. The build photo is by Airasumi. 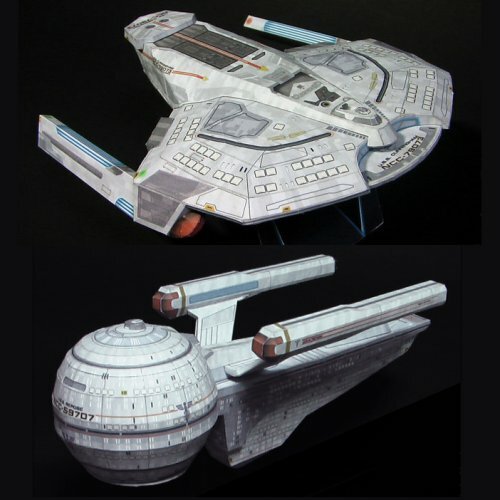 Zosho calls himself a "novice card model designer", but his designs of Star Trek spacecraft look pretty top notch to me. ^^ Zosho recently released two more templates in his growing collection: a Saber-class starship and a Olympic-class starship. The Saber-class is a small, heavily armed ship while the Olympic class is primarily used as a hospital ship. The JPG templates for the ships may be downloaded here and here. Last year I posted a Romulan Warbird by Zosho. Somodi Zoltan runs a blog filled with his color-it-yourself papercraft creations. Somodi primarily offers architecture paper models, but also has several templates of cars, trucks, and airplanes available. 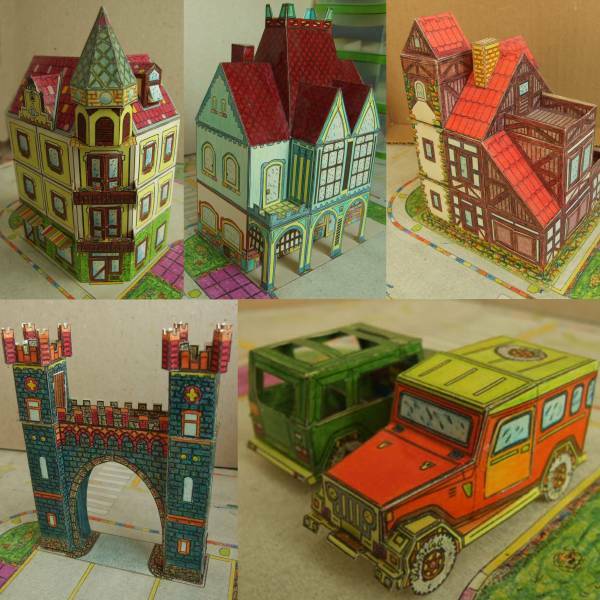 Each of the papercraft models is modeled after the type of architecture and vehicles found in his native Hungary. Want to see more? Somodi's blog is located here.